Poultry Flock Management System: Aihen. To discover threats before they occur. Agricultural development is one of the most powerful tools to end extreme poverty, boost shared prosperity and feed a projected 9.7 billion people by 2050. Currently, in Europe, 7.3% of all agricultural industry is based on egg and poultry farming. But at the same time, it is known that the poultry ﬂock management sector is not yet technically advanced and only a few organizations use any type of IT systems to manage and monitor their enterprises. However, Latvian Case Study has proven how important is to see the value behind using innovative IT solutions at a very young age. The core purpose of Aihen. 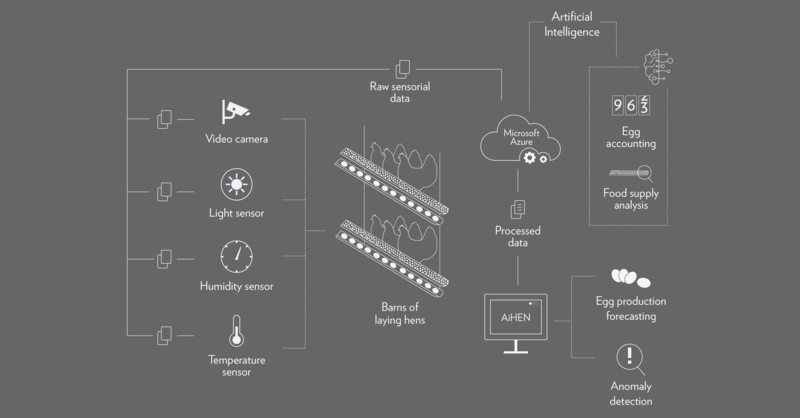 is to gather data accumulated from various sensors, such as temperature, humidity, light and video camera, and to predict the production volume of laid eggs with the help of Microsoft Azure Cloud and AI, as well as to automatically detect anomalies in the feeding supply. Aihen. the opposite of a Swiss knife: it is an industry-speciﬁc platform that ingests and processes data and automates business processes for egg producers. 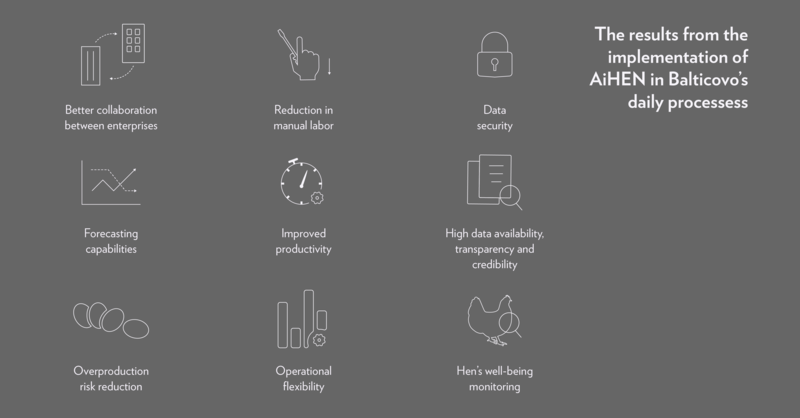 It puts all the production data at the ﬁngertips of poultry experts and management wherever they are, at any time, in a manner speciﬁcally addressing the requirements of the poultry industry. Built natively for the cloud, it requires little upfront investment, allows fast implementation and provides maximum operational efficiency liberating egg producers from most laborious IT maintenance and operational tasks usually associated with running enterprise-grade applications in-house. Aihen. is built to help not only large enterprises, who works in the Agriculture industry but to small and midsize farms as well, so that everyone is able to boost their production, improve productivity and reduce costs. Who helps us in advancing Aihen? Thanks to EU funded programme "2014 - 2020 INTERREG V-A Estonia - Latvia" project "Cloud based IT platform for poultry flock management" we are able to further develop Aihen to deliver a product with the highest added value. The output of the project is, by collaborating between dots. and Wazombi with Straupes Ligzda, Linnu Talu and facilitated by Latvian Poultry Union and Estonian Poultry Society, to jointly build a product: cloud-based IT platform for poultry flock management designed for small and medium enterprises, that could be used for poultry flock management in programme area, Baltic region, European Union and beyond. To read more about the project please see the project website: www.aihen.eu.